Since I’ve been receiving a lot of questions and requests about my makeup must-haves, here you go! I don’t usually use primers or makeup base for my everyday makeup. For me, the less gunk on my face, the better. I only use them when I’m off to an event or party. And I don’t use all 3 of them together. I usually just combine 1 or 2. 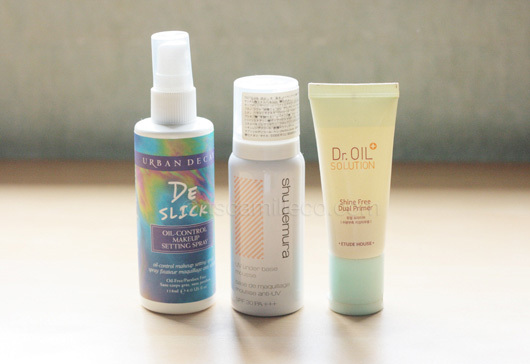 Among the 3, Dr. Oil Solution from Etude House works best for me. It successfully controls shine and oil while still maintaining a dewy look. It feels really light on my skin too! If you want something mattifying, go for the mousse from Shu Uemura. If you want to take oil-control to another level, try a setting spray like Urban Decay’s too. Spray it on before and after applying makeup. What I really like about Urban Decay’s setting spray is that it doesn’t feel any different from ordinary facial mists. It doesn’t smell like hair spray! For my everyday make-up, I only use BB creams. I apply the BB cream below my eyes, on the sides, and under my nose and lips, and spread a little out from these areas. I don’t apply it on my whole face. 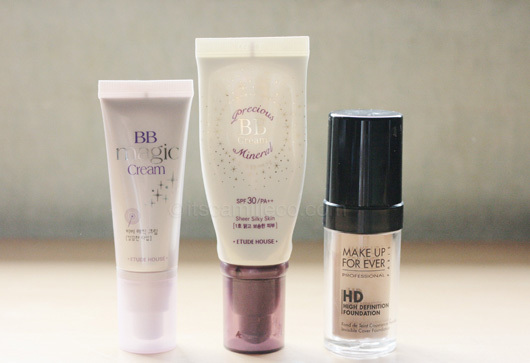 The BB cream I’m currently using is the one on the middle. The one on the left is what I’ll use next once I finish my current BB cream. They say it’s a new and improved formulation and the color is a little bit darker. For events, I use the liquid foundation from Make Up Forever. I used to use Bare Minerals as my everyday foundation before I switched to BB creams. Now that I’ve switched, I only use it as a concealer for marks or breakouts whenever my BB cream can’t do the job. I mean it’s bad enough to use makeup to cover breakouts so the least you can do is use something lightweight like mineral makeup if you really have to cover them. The pen-like thing behind my Bare Mineral makeup is the YSL Touche Ã‰clat or Radiant Touch concealer. It is THE BEST!!! I swear by this product. I apply it under my eyes, on the center of the bridge of my nose, on the sides of my nose and a little under it too. It really brightens up my face because, if I remember correctly, it works like a reflector. 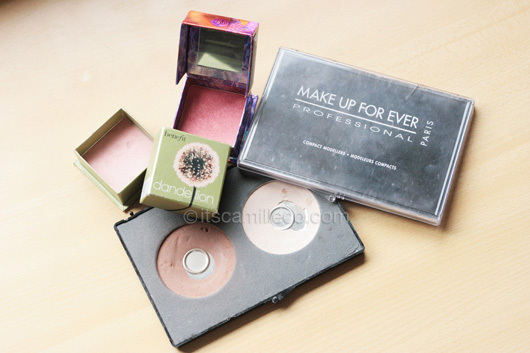 These are the usual palettes that I use. The Shu Uemura palette has a nice summery feel to it because of the shimmering gold and bronze eye shadows and cream-colored highlighters. It’s also perfect for traveling because the palette already has a gel eyeliner and blush too. The palette I use the most is the 5 colour harmony from YSL. I like using the pinkish brown color and mixing it with the purple eye shadow from Red Earth. 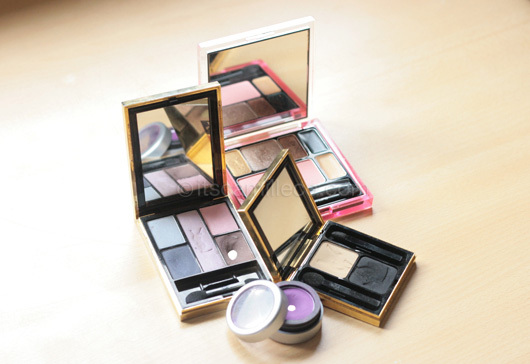 Most of the time, I apply the purple eyeshadow near the areas where I line my eyes. I feel like it makes my eyes pop. Lastly, the YSL eye shadow duo is for my smokey looks for night outs. I love this palette so much because it’s matte. Dont you just hate impossibly hard-to-handle liquid eyeliners? 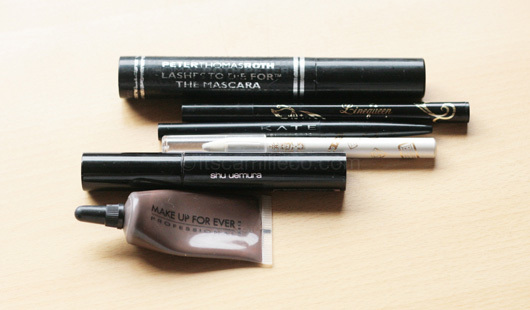 The Japanese product Linequeen liquid eyeliner is the best. It’s easy to apply and doesn’t smudge. I’ve tried so many gel/liquid/pencil eyeliners and nothing beats this. Actually, most Japanese eyeliners work best! Anyway, I use the liquid eyeliner to line my upper lid. The pencil eyeliner is only applied on the innermost part of my eyelid, really really near the base of my upper and lower lash lines. Sometimes, I use the white eyeliner too to line the inner corners of my eyes to brighten them up. For that fresh, blooming look, try Benefit’s Dandelion. It’s my favorite! 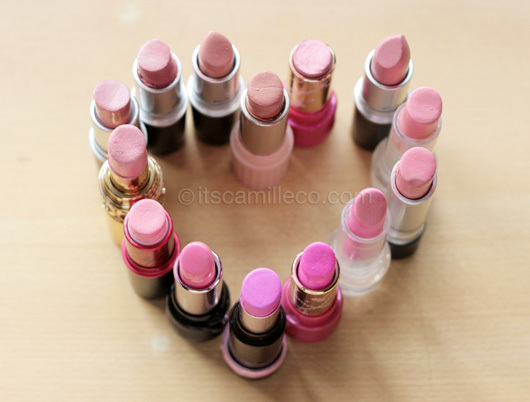 If you can’t find this brand, you can also try Shu Uemura’s M Pink 31 blush. It used to be my blush before I switched to Benefit. After I apply the Dandelion, I sometimes apply the Bella Bamba on top of it. I love it’s highlighting effect because it has a little shimmer in it. Be careful though when you use the Bella Bamba because it’s really a strong kind of pink. I usually just dab (not even sweep) it on the apples of my cheeks really really lightly. For contouring, I use Make-up Forever. These are my regulars (Hindi ako masyadong mahilig sa pink). My current favorite is the MAC Satin Myth combined with MAC Viva Glam Gaga Lustre. That’s it! I hope you enjoyed my makeup must-haves! My next makeup post will probably be about Tony Moly. I can’t wait to try the products they sent me. They’re all really cute! Stay tuned! ask ko lang san po pwedeng makabili ng linequeen na liquid eyeliner?pls i really want to try. Thank you! :) I don’t know if it’s available here in Manila because I buy mine at Hong Kong.